This paper investigates senior secondary mathematics students' identification of teaching practices that they perceive are conducive to their learning. An existing framework describing aspects of pedagogical content knowledge (PCK) was used to analyse survey and interview data from two classes of students studying discrete and continuous probability distributions. Students identified that their teachers exhibited several elements of PCK as contained in the framework. 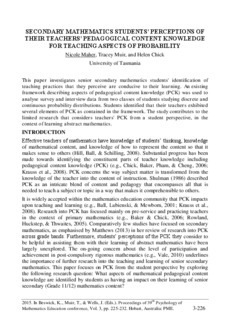 The study contributes to the limited research that considers teachers' PCK from a student perspective, in the context of learning abstract mathematics.